Spring has sprung, and it's time to celebrate with fresh flavors! Heavy, rich desserts are out, and light and refreshing desserts are in. These spring candy recipes feature the best of what the season has to offer: lots of sweet berries, zingy citrus, and delicate floral flavors. Hit the local farmer's market, then give one of these recipes a try! 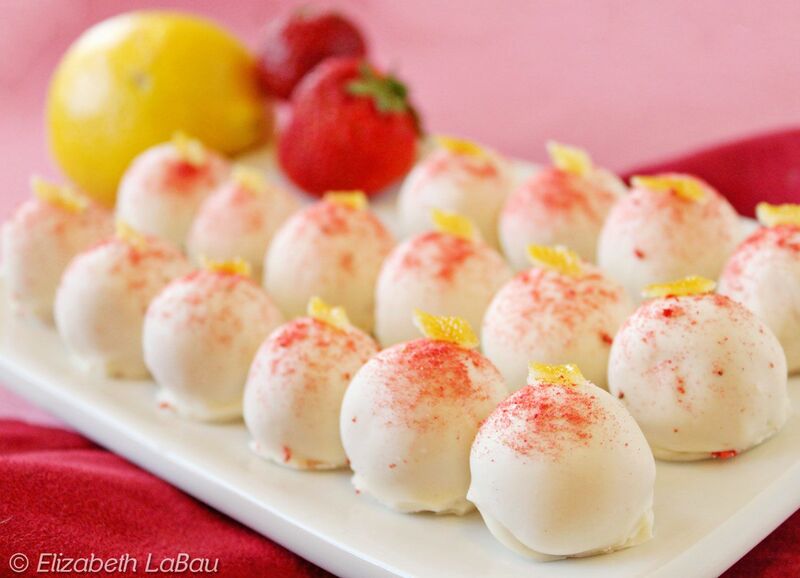 Strawberry lemonade truffles are made with real strawberry puree and lemon zest, to give these white chocolate-based truffles an intense and realistic taste. We love topping them with a sprinkling of strawberry powder and a sliver of candied lemon rind, to add even more flavor and texture. Follow the arrow to the next slide to see more springtime candy recipes. Love the combination of chocolate and fresh strawberries? Instead of making traditional chocolate-covered strawberries, try this twist on the classic recipe and make inside-out chocolate covered strawberries instead! In this fun and elegant dessert, fresh strawberries are filled with a rich chocolate truffle mixture. It's like two candies in one! The berries are beautiful, delicious, and have the perfect ratio of chocolate to strawberries. This layered chocolate lemon bark is so gorgeous and so easy! Lemon and chocolate are an amazing combination, and the flavors really shine in this candy. A semi-sweet chocolate base is topped with lemon-flavored white chocolate, and chunks of candied lemon peel. It's both creamy and chewy and bursting with vibrant lemon flavor. We love white chocolate fudge, but sometimes it's just a bit too sweet. That's why we think this lemon fudge is perfect—it's a smooth white chocolate fudge, but it has a lot of tanginess thanks to lemon zest, lemon extract, and a pinch of citric acid. You can also dip it in chocolate for a real treat! Raspberry rose truffles are gorgeous chocolate truffles with the delicate flavor of roses and tart, tangy raspberries. If you're a little scared to use rose water in your desserts, this is a great intro recipe—it's not too overpowering, so all you get is a little rose flavor and a lot of raspberry tartness. If you want to really go all out, top each truffle with a beautiful miniature fondant petal. This lavender fudge is a smooth, creamy fudge with a melt-in-your-mouth texture and a lovely lavender flavor. We haven't always been a fan of floral desserts, but when they are done right, they are delicious. If you're not sure whether you're a lavender fan, give this recipe a try and see what you think! Dried lavender is easy to find in many large supermarkets, located near the herbs and spices. Rhubarb is a star when it comes to pies, but it's not often used in candy recipes. We're here to change that! We think the tart flavor of rhubarb needs to be incorporated in more sweets, starting with these rhubarb truffles. These rich truffles mix the signature sour flavor of rhubarb with sweet, creamy milk chocolate for a sweet-tart truffle that is absolutely irresistible. Did you know there are many flower varieties you can actually eat? Edible flowers are making a comeback, and they can often be found at farmer's markets and near the fresh herbs in Whole Foods and other large supermarkets. They're beautiful and delicious when served on cakes and other desserts, but they wilt quickly. Candying flowers gives them a little more staying power, as well as a beautiful sparkly sugar appearance and delicate crunch. This recipe for candied flowers is easy, and will produce gorgeous edible flowers you can use on any dessert! You won't believe how easy it is to make these smooth lemon creams! Whip them up in the mixer, dunk them in chocolate, and people will think you bought them from a candy shop! You can also make other citrus flavors with this recipe--I think tangerine and grapefruit would be especially delicious.